Join us in Death Valley. 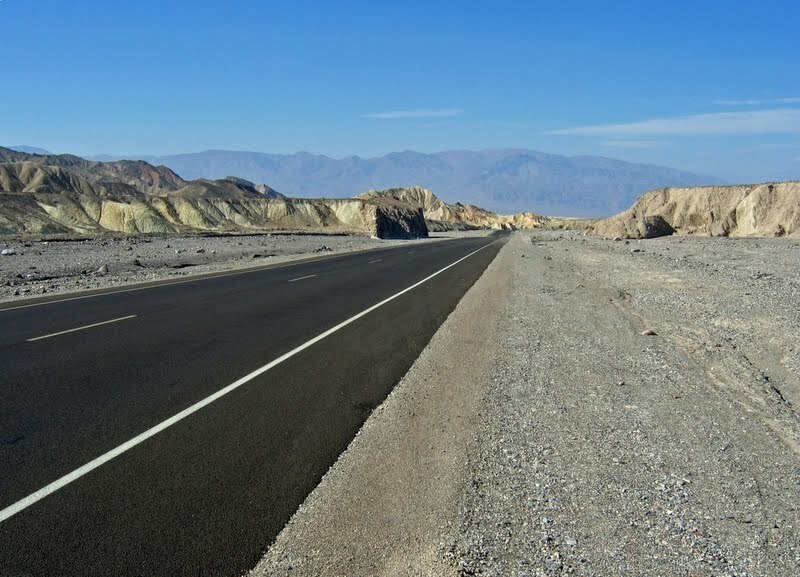 Ride with us in Death Valley on October 16th and find out more about the program through JDRF by visiting their website. The 2009 Ten Year Team. For details, descriptions, and photos of our 2009 training, fundraising, and ride weekend in Sonoma, click here. JDRF, staff, coaches, the medical team, volunteers, and riders have a saying that they want to see everyone back after a ride event "Safe, Sound, and Smiling." The last thing that any of them want to see is a rider who pushed themselves past their own limits and therefore requires medical attention by the paramedics or doctors on site. In weather like we experienced Saturday in Death Valley, dehydration is far too common. If it is not caught early, it can result in IVs, heat stroke, and even death. Friday's safety meeting was no joke. They really hit home the fact that we all needed to be drinking water and electrolytes as fast as we could. The truth of the matter is that in the "dry heat" there really is no way to drink more electrolytes as fast as you lose them. Point being...it was hot, real hot, and hydration was by far the most important part of the weekend. Jessica and I were once again reminded that our fight for a cure for diabetes is one that we are not alone in. The whole process of the Ride to Cure Diabetes showed us that we do have loving friends, family, co-workers, and in some cases, total strangers, who are with us in this fight! From fundraising, to training, to the actual ride weekend...we are all in this together. For those of you who donated your money, thoughts, and prayers; as promised I rode all 104 miles with a list in my jersey pocket with each of your names. One of the first things that I told Jessica after the ride is that when it got hot (real damn hot), lonely, and downright difficult on Saturday, I pulled that list out of my back jersey pocket and just read the names. I cannot really explain how seeing each of your names made me feel when I was in the middle of absolutely nowhere amongst my coyote friends (yes, we really did ride past a coyote watching the ride from the side of the road) in Death Valley National Park. Thank you for your support once again this year. As I tweeted on Saturday, I sure hope we find a cure soon because I do not want to have to go back there and ride again. During the ride, during one of the lonely and hot times, I did make a video so that each of you could get a glimpse into life in the desert. I hope you enjoy the video and I look forward to seeing each of you soon. It is all about the journey and the Ride to find the cure! For any of you who have been affected in one way or another, directly or indirectly, by a terminal illness, you know what it is like. Whether you are diagnosed yourself, or you care for someone who is, you know what I am talking about. Regardless of the diagnosis, it is never easy. However, events such as the Ride to Cure Diabetes weekend help us remain constantly reminded about the need to find a cure. Out of the 350 riders here in Death Valley this weekend, all of them have a passion to find a cure for diabetes and its complications. That reason alone is why they support JDRF and why they have taken time and money to be here this weekend. I met a family from Cleveland, OH. There are three of them who made the trip to DV this weekend. Mom, Dad, and 10 year old daughter. Their daughter is not very comfortable wearing her insulin pump in a place on her body that is visible, or having the actual pump clipped to her waistline, because she does not want others to see her with it on. It is sad, it is disheartening, and it is just one of dozens of reasons that a cure must be found in our lifetime. Thank you again for supporting me through donations, prayers, and words of wisdom during my 2010 training process. Below are a few pictures from our exploration around DV today during a few hours of free time. Many more photos will be posted post-ride. We are heading off to eat dinner with the entire group shortly and then we leave Furnace Creek Ranch for our 105 mile journey in 100+ degree temps tomorrow at sunrise. Time to find the cure! Really? This is where I am riding my bike 105 miles on Saturday. What was I thinking!? This is a big week for The Shafer Family. While this is our second time doing the Ride to Cure Diabetes event, anytime we participate in a diabetes fundraiser I am constantly reminded how important it is to have great Type IIIs to lean on in life. In less than two weeks, I will have my 12 year anniversary since being diagnosed with diabetes. If it had not been for our loyal and gracious friends and family, the journey over the last 12 years would have been much more difficult. From my parents who were with me on Day 1, to Jessica who puts up with me today, day 4,367, I could not have done it for this long by myself. Everyone has their own trials and tribulations. There are always times when you want to "turn around, pack it up, and call it quits" (- Steve Jobs Quote). Jobs goes on to say "these are the times that you know that you are pushing yourself, that you are not afraid to learn by trying." We all have obstacles to overcome. Life is never easy, living with any type of medical condition is never easy, cycling 100 miles is never easy, taking the plunge for that "job of your dreams" is never easy. Whatever the situation, it is through perseverance, determination, and a support network, that we all make it through. On Thursday morning, Jessica and I leave for the airport. We fly west and will be in Death Valley by dinner. The entire Ride Weekend is a great testament to the hard work of JDRF. However, and this is frequently said, "JDRF is in business to put themselves out of business." Maybe this is the last year that an event like the Ride is needed. Maybe next week, next month, or next year, a cure will be found. Those of us with diabetes will be cured and then focus on the part of scientists and researchers can be turned to other incurable questions that remain. Until then, please continue supporting anyone you may know who is also in the fight for a cause close to their heart. By the way, I am only $130 away from my $3,000 goal. Pass this on to someone else who you may know that would be interested in making a gift to the cause! Or, just ask them to CLICK HERE. Thank You! The bike is on the truck heading west on "The Gray Lady!" 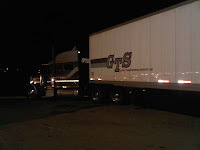 I met Paul, the truck driver for Gainey Transportation Services, on Sunday night around 10pm. The sea of semi-trucks idling in the crisp fall night at the Pilot Travel Center was no match for the Honda Pilot. After knocking on the cab door of the wrong truck, I found the right truck and Paul loaded the Trek. We discussed "The Ride" for a few minutes and then he was back on I-40. From Knoxville he was traveling to Greenville, SC, then on to Atlanta, Indianapolis, Denver, and then Death Valley, picking up a few more bikes at every stop. Two weeks from today Jessica and I leave for Death Valley. Thanks to all of you, we are doing well in the fundraising but still hope to raise more as we work for a cure! In case you were wondering, today's high in DV is 112. Fear not though, temps will get into the 60s at night and only rise into the 90s during the day starting next week. Let's hope winter hits the dessert in two weeks! Here is the ten day forecast as it stands right now. 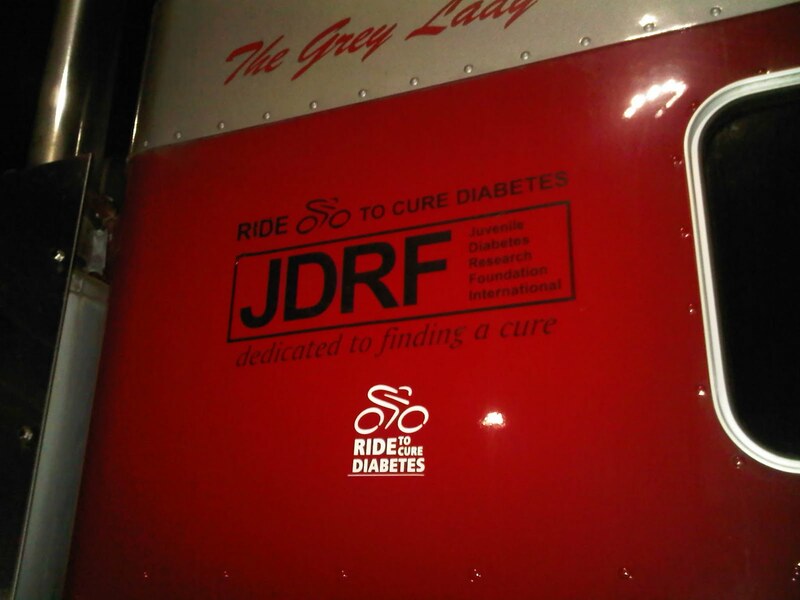 The semi-truck that drives around the country picking up bikes for each JDRF Ride event will be coming through Knoxville on Sunday night or Monday morning. Paul, the truck driver, will be meeting me to pickup my bike and load it in with the hundreds of other rider's bikes who are making the trip to DV this year. After my bike is picked up, I hope to ride Jessica's hybrid a few times next week and the following week before we leave. It will be a bit like training for a swim meet with a t-shirt on...helps to have a little "drag" attached to you so that the road bike feels like feathers on October 16th!